Comment: Some dust jacket wear but overall great condition. Clean pages with a tight binding. Ships direct from amazon or prime or super saver (free) shipping. Thank you! In 1982, a toxic waste facility opened in the Piney Woods in Winona, Texas. The residents were told that the company would plant fruit trees on the land left over from its ostensible salt-water injection well. Soon after the plant opened, however, residents started noticing huge orange clouds rising from the facility and an increase in rates of cancer and birth defects in both humans and animals. The company dismissed their concerns, and confusion about what chemicals it accepted made investigations difficult. Outraged by what she saw, Phyllis Glazer founded Mothers Organized to Stop Environmental Sins (MOSES) and worked tirelessly to publicize the problems in Winona. The story was featured in People, the Houston Chronicle magazine, and The Dallas Observer. Phyllis Glazer was voted one of the 20 Most Impressive Texans of 1997 by Texas Monthly because of her work in Winona. The plant finally closed in 1998, citing the negative publicity generated by the group. This book originated in 1994 when Cromer-Campbell was asked by Phyllis Glazer to produce a photograph for a poster about the campaign. She was so touched by the people in the town that she set out to document their stories. Using a plastic Holga camera, she created hauntingly distorted images that are both works of art and testaments to the damage inflicted on the people of a small Texas town by one company’s greed. In the accompanying essays, Phyllis Glazer describes the history of Winona and the fight against the facility, Roy Flukinger discusses Cromer-Campbell's striking photographic technique, Eugene Hargrove explores issues of environmental justice, and Marvin Legator elaborates on how industry and government discourage victims of chemical exposure from seeking or obtaining relief. Tammy Cromer-Campbell is a photographer based in Longview, Texas, whose photographs have been featured in Foto Mundo, CameraArts, and on CNN. Phyllis Glazer was voted one of the 20 Most Impressive Texans of 1997 by Texas Monthly because of her work in Winona. Roy Flukinger is the photography curator for The University of Texas’s Harry Ransom Humanities Research Center. Eugene Hargrove is founder of the Center for Environmental Philosophy at the University of North Texas. Marvin Legator was a toxicologist who examined many of the citizens involved. Gibralter, Inc. came to Winona, Texas promising to plant orchards but dumped toxic waste instead, turning Winona into a Cancer County. 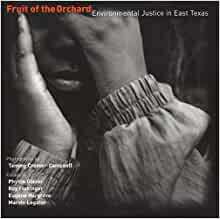 Biblical in its themes, "Fruit of the Orchard" is a documentary collection of photographs made by the folks, especially the children, whose lives were afflicted. These photos strum the heartstrings. The book includes brief, insightful essays on Toxicological Myths and Preventing Future Winonas. "Fruit of the Orchard," elegant in its simplicity, is a gem of a book. Who pays the ultimate price for better living through technology? For cell phones and computers? For sleek vehicles? Often, city dwellers would like to have a place where they can go to slow down, a Brigadoon. In Dallas, we'd like to think that some place like that exists. But small towns, already poverty stricken, are sometimes targets for toxic waste plants that prey on the innocence and simplicity that we seek in rural America. Phyllis Glazer was one of those city dwellers, seeking the American Dream in Winona, Texas. But what she found was a covered up mess - a wasteland, a toxic waste dump, hidden by the beauty of East Texas. Using photographs taken by professional photographer Tammy Cromer-Campbell, this book documents the problems faced by Winona residents, including birth defects, cancer, respiratory problems, deformities, and damage to animals, crops, livestock, fish. ; Tammy captures the essence of the mystic gaze and the sorrow in the eyes of the children, the imperfections and the faults and the beauty. Phyllis says, "She [Tammy] told me later that she was about to ask Jeremy to look sad for the photo, but didn't have to. His little soul reaches out to you from that photo, his eyes speaking of anguish and despair." Readers of "Fruit of the Orchard" will feel angry, frustrated, sad, sympathetic, shocked, and naïve. How could this happen in America? The Gibraltar plant is closed, but "The Fruit of the Orchard" is still being harvested every day. And there are thousands of Winonas. Two hours north of Interstate 20 is another small town served by the same aquifer. Sludge from the Hudson River in New York City is being freight trained to West Texas. Where does it end ...?